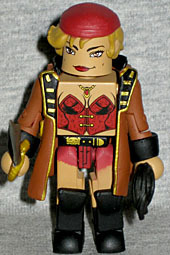 The first Femme Fatales Minimates box set featured four women from comicbooks - the second one is keeping things a little more "in-house," giving us Minimate versions of four characters seen in Diamond's statue line. Down the rabbit hole and through the looking glass, Alice has seen things that she can't unsee. Things that would drive normal people mad. But Alice isn't mad. In fact, the maddest thing that Alice ever did... was go back to Wonderland. 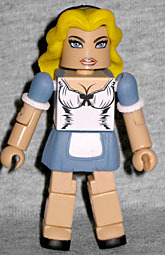 Wow, a more adult Alice being turned into a Minimate? Haven't seen that before! Of course, this is a more traditional Alice - and by that we mean "closer to the Disney version," because that's the way it works. Like in the Disney cartoon, she's wearing a blue dress with a white apron, but it's noticably tighter here than it was in animation. It's almost as though she's been wearing the same clothes since she was 13, and is now just filling them out more. Her black shoes are painted on, but the frilly white cuffs on her sleeves are actually separate pieces pushed onto the arms. Another costume feature everyone copies from Disney is Alice's black headband. That's present here, of course, and it stands out starkly from her bright yellow hair. The hair is a new piece, because who else could she share it with? (If you said Gwen Stacy, you're a true comicbook nerd.) The face is exceedingly plain, and could honestly be used for any young female. Okay, we said it when DST first showed off their Femme Fatales statues at Toy Fair 2011, and we'll say it again right now: somebody at Diamond is severely confused about who Medusa was. For the record, she's the one with the snakes for hair - the Sirens are the ones who live in the water. The bio on the back of the statue box deals with this, slightly, pointing out the Gorgons are distant cousins to the Sirens, and it also introduced the notion that she was searching for the man who got away from her - however, it's only here on the Minimate packaging that we learn who that man is. Nice cross-marketing, guys! 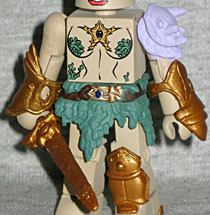 The Medusa statue was designed by Uriel Caton, and the Minimate takes its cues therefrom. She is wearing armor, but it's not a direct copy of what the statue had: golden bracers and a single greave (in the package she's wearing it on her right leg, not her left, but that's easy to switch). 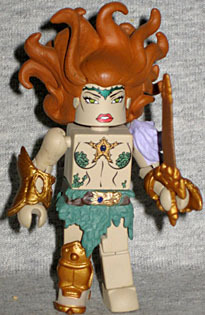 Her torso details are painted on, including the starfish on her chest and her seaweed bra, but the seashell on her left shoulder is a molded part of the arm, and her skirt is a new piece. She's bare beneath it too, like all good swimmers. She comes with a sword, though it's much smaller than the behemoth the statue was swinging around. And then there's the hair. To simulate the character being underwater, her hair actually rises and drifts away from her skull, rather than hanging down. It's large and complex, and must have been murder to get out of the mold. She has a seaweed tiara painted on her forehead, and her skin has a gray pallor that makes her look inhuman. Female pirates are rare, but Anne served with famed buccaneer Calico Jack aboard the pirate ship Ranger, and could swing from a yardarm and dispatch a zombie as good as any man - usually better. It's neat that more characters are being added to the "Calico Jack's Pirate Raiders" line. Like most of the characters in that line, Anne Bonny was a real person: in fact, she was Calico Jack's wife (or at least his sea-bride)! She was born in Ireland, but her family emigrated to America. Her mother died soon after, her father failed as an attorney and became a merchant, and she married a small-time pirate named James Bonny who hoped to inherit his new father-in-law's money, but instead Anne was disowned. And then she started sleeping with Calico jack, so James Bonny just had no luck at all, did he? 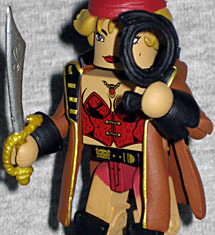 The real Anne Bonny had red hair, but this Minimate and the statue it was based on are both blondes. Her skin is darker than the other girls', which makes sense since she'd constantly be getting sun-baked on the deck of the ship. She has lopsided smirk on her lips - better that than another vacant, porny, "lips parted" face. She looks salty! Speaking of salty, Anne is wearing knee-high black boots with separate boot-fronts, a fancy brownish-maroon pirate coat with gold trim and a black lining (as seen on the collar and cuffs - yes, they match), a red corset and red cutoffs. Some legends say that the real Bonny dressed like a man when abord the ship, but that's not entirely true: she dressed in whatever was comfortable and workable for the situation; so while she would sometimes wear male clothes when attack other ships, she was perfectly happy to dress like a woman at other times. When Jonathan Barnet finally captured the pirates, Anne Bonny was one of only three crewmembers who didn't run and hide - fittingly, she comes with a cutlass and a coiled whip. 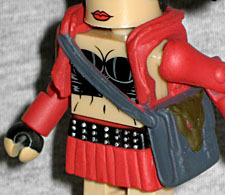 Look, it's an Abby Sciuto Minimate! Perky goth? Check. Black hair in pigtails? Check! Clothes no one who didn't work at a Hot Topic would never be able to get away with wearing? Check! 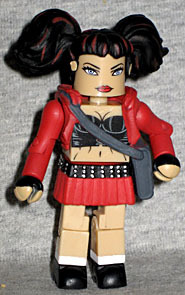 It's a shame the Dark Angel Minimates never had a Logan Cale, or we'd have a Tony to go with her! The idea of a tarted up Little Red Riding Hood is nothing new, but hey, we're not going to complain about seeing it again! Minimate Little Red doesn't get clothes as detailed as statue Little Red. For instance, plain black feet instead of Doc Martens, and bare legs instead of fishnets. Her skirt (and the lining of her short red coat) are lacking the green, black and white plaid pattern, but her black bustier is painted with all the same details sculpted on the statue. She doesn't have the wolf tattoo on her neck, but come on: how were they supposed to do that on a Minimate? On the other hand, her messenger bag - which is molded as part of the jacket - has the wolf head on the flap just like it should, and the head even gets brown and red paint apps. There are red streaks in her black hair, which would have been an easy corner to cut, but Art Asylum kept them in. The face... I don't know, this may just be because we've got Abby on the brain, but the face looks like Pauley Perrette. Seriously, this Minimate has a better likeness of an actress it's not meant to be than some licensed Minimates have of who they intended. The way the Femme Fatales statue line mixes original designs with comic heroines is a clever marketing hook, and it's nice to see the Minimate version following suit. All four of these girls are good in their own way, even if you're not looking to expand the universe of the Pirate Raiders, to start a set of NCIS customs, or have a Disney-esque character meet her darker and edgier equivalent.